"If your words sell, you're liberated. If they don't, you're stuck doing manual labor." Perry Marshall. All the issues you've experienced with 'tortured artiste' or 'deadline averse' copywriters are a thing of the past. I solve these eight copywriter problems. Scott Martin is a rare find—a copywriter who understands how to motivate customers to call or get out their credit cards and buy! He has a genuine enthusiasm for great copy, is fun to work with, hits deadlines, but most of all—he gets results! Will Swayne, Founder, Marketing Results. PROBLEM TWO... THE COPY IS NOT CONVERTING. Contact me and I'll be happy to provide actual results. PROBLEM THREE... IT'S WAY OVER BUDGET. My rates are sensible. I'm not Elance low and I'm not 'rock stars of copywriting' high. If you want really, really low rates ($75 for a website), I recommend you visit Elance. You'll find plenty of copywriters but be warned... anything could happen. PROBLEM FOUR... THE COPYWRITER HAS DISAPPEARED. I communicate quickly and often so you know the project is moving forward. And I return calls and reply to emails. PROBLEM FIVE... THE COPYWRITER DOES NOT UNDERSTAND THE PRODUCT/SERVICE. I’ve written copy for everything from mortgage services to golf resorts and from pay per click software to home repair services. I can quickly understand the business model and marketing strategy and put myself in the shoes of the customer so the copy produces results. B2B and B2C. Unlike most copywriters, Scott has a great understanding of direct response copy. The kind that actually makes you money instead of merely filling the page with prose! That's why we use him again and again. Andrew Wood, President, Legendary Marketing, Lecanto, Florida, USA. PROBLEM SEVEN... THE COPYWRITER IS TAKING UP SPACE IN MY OFFICE. I work remotely with clients all over the world. One client is 9,264 miles from my office. PROBLEM EIGHT... I NEED MORE THAN COPY. I write everything from landing pages to white papers and from sales letters to websites. Everything for the direct response environment. Copy and content. I'm here to help you make money and make your life easier. If you're the owner of an agency, you've promised your clients results. I can help you produce these positive results so your clients give you more business. If you're an account manager at an agency, I'll provide copy that converts so you exceed your goals, impress executives and clients, and never again have to spend hours searching for a copywriter. If you're a decision maker in a company that uses a direct marketing approach, my copy will convert and help you reach your revenue targets. And if you're an entrepreneur or small business owner, I will help you tap into the power of direct marketing so you generate more revenue and increase the value of your business. Clients who measure results and are serious about direct marketing send me more assignments. Why? I have the proven ability to convert readers into buyers through the precise execution of direct response copywriting techniques. Opt-in page for real estate investment company. 25.6% sign up for the report. Career counseling company. 6.27% of visitors call for consultation. Residential Real Estate Buyers Agent. 5.76% of visitors opt-in for report/providing information. Business consultant. 100/100 webinar spots filled from list of 825 through email series. Business advice opt-in page for free series. Converting at 8.89%. A simple letter for a local roofing company generated a 4% response—closed sales. A blog for a gold company in Australia has helped the company get the #1 ranking for 'buy gold' on Google. I provide full copywriting services for direct marketing professionals and individuals who use a direct response model to market their products and services. 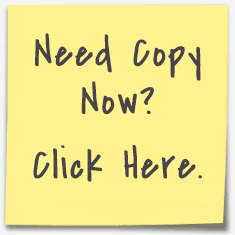 You can rely on me to provide ALL the copy you need in today's marketing environment. Contact me now for a quote. I understand the pressures you face...and I'm here to help. In direct marketing, we HAVE to produce. We have to drive traffic to a website or we have to persuade a prospect to call a telephone number. We have to convert website visitors into clients and customers. We're totally unlike our brothers and sisters in the branding world: we've chosen to be accountable. Instead of logos and powerpoints and 'feelings' and 'brand-centric clarity' you've chosen Google Analytics and the number next to the word CONVERSION. You want your clients to continue to feed you work based on the leads you provide and the money you generate. For my clients, I become their 'go to' copywriter. Click here now for a quote. 'Corporate' and Subtle or REALLY LOUD and OBNOXIOUS? I can turn up the volume or turn it down depending on the approach the reader expects. Go here for samples from my portfolio. Deal with a copywriter you found through a site like Elance and deal with the mind-numbing problems that usually come with a mystery provider. Give me the opportunity to prove my copy converts readers into buyers...and enjoy having a dependable copywriter on your team. For my full portfolio, click here now. I look forward to helping you generate leads and revenue and solving the typical copywriter problems. Call me at (704) 517-0241, Skype me (ScottMartin22), or contact me here. P.S. Make sure you ‘cover all the bases’ with every direct marketing campaign. Click here now for my exclusive direct marketing checklist. Traffic. However, once you get traffic, I can convert it into cash. SEO. I'm not intelligent enough to understand it. After all, I'm just a copywriter!